Little did we dream that someday we would learn much more about Hannah's whole family and reams about Spencer’s family, even though the intervening generations between Spencer and William I at this point remain a mystery. We learned that the oldest sister Annie married Seymour Lockwood, not Sachwood¸ and that Hannah’s second daughter married one of Annie’s younger sons. We even learned that there may have been an earlier Hannah who died quite young, so that Hannah Marie was really the 12th child, not the 11th. In that time when so many families lost multiple children in infancy, the Compton family must have felt blessed to have lost only one. All eleven grew up and married and had children, some of them lots of children. I had always known that Guy Lockwood’s parents were Seymour and Minnie Lockwood, which made him cousin to my great-grandmother Esther Stauffer Porter. Minnie was a sister to Esther’s mother, Roxy Wells Stauffer. What I did not know was that there were two Seymour Lockwoods, one the father of the other, and the father (the one I didn't know about) was married to the oldest of the Compton children, Grandmother Wells’s sister Annie (Anna in the records). So Guy’s parents, Seymour and Minnie, were first cousins. The father of the Compton children bore the same name as his father, Hannah’s Revolutionary War grandfather, William Compton. For simplicity, we refer to them as William I and William II. Hannah’s Bible tells us that her grandfather fought and died with the militia of Orange County in eastern New York, and other records confirm that (again, see Compton-Wells). We have also found records that William I had two brothers, Jacob and Vincent, and that they were involved in the earliest history of the town of Cornwall in Orange County. There were, in fact, a number of other William Comptons in the family, in both earlier and later generations. And there were apparently many William Comptons in the early colonies and even others who fought in the Revolutionary War. We now know that William the son was born in the midst of the War (1776). If his father died in the War, and records beyond our own attest to that, then the young William may have scarcely known his father. William the son had an older brother named Runyon, and we have been in touch with descendants of his as well. On February 23, 1794, in Orange County, New York, William II married Hannah Phebe Post, daughter of Peter Post and Mary Canfield Gibbs. Internet records indicate that all the Compton children until Susannah, the one just before Hannah, were born in Orange County but that the last two were born in Tyrone, Steuben County. For Hannah, that birthplace is confirmed in her obituary. So sometime between 1812 and 1816, the Compton family pulled up their roots and migrated westward across the mountains and through the forests to the southern Finger Lakes area of central New York. So what was Hannah’s family like when she was growing up? As the youngest of eleven children, was she surrounded by a passel of older brothers and sisters? Not as many as one might think. For starters, when she was born, Hannah’s brothers and sisters (note that Annie was the only girl until she was 18) were the following ages: Annie, 27; David, 25; Hezekiah, 23; Peter, 22; Runyen, 19; Abraham, 16, John P., 12; William, 11; Elizabeth, 9; and Susanna, 5. We can piece together a surprising amount about their lives, considering that close to two hundred years have passed since Hannah’s birth. Not surprisingly, however, some matters remain cloudy. We know that Anna (1794-1882), called “Annie” in Hannah’s Bible, was married, already had several children (she had twelve all together), and she and her husband had migrated westward to the Finger Lakes area. 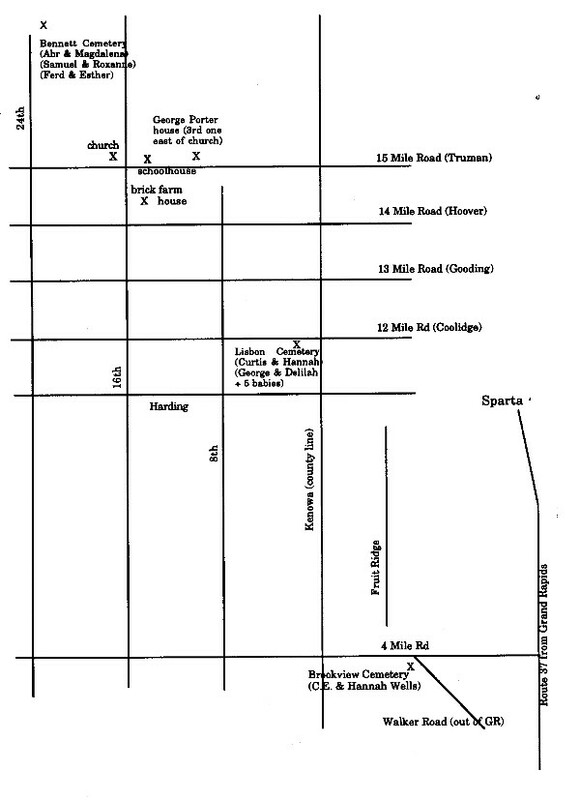 Our latest information is that Seymour Lockwood and a couple of Compton brothers were among the earliest settlers in Steuben County south of Lake Seneca. Can’t you just see them sitting around the fire, talking late into the night—the visionary young bridegroom and a couple of his new brothers-in-law, discussing the idea of making such a major move to the exciting new territory across the mountains? Apparently that move inspired his bride’s parents, William and Hannah Phebe, to follow a couple of years later before their last two daughters were born. We have met in person a lady who is descended from both Annie and her brother John P.
David (1796-1865) was married the year after Hannah was born and his first child was reportedly born in Orange County, so he apparently initially stayed there when the parents moved. However, he has at least one child buried in a cemetery in the Donovan Hill area in west central New York, so he too must have joined the family there for at least a few years before moving to Ohio, where he is reported to have died in Ottawa Co. He and his wife had seven children that we know of, with at least six of them growing to adulthood and marrying. A descendant of his wrote a fairly in-depth history of his branch of the family and of the Comptons going back way back, as well as the building of their castle homes. We have made contact with a descendant in our times as well. Hezekiah (1798-1877) was not married until Hannah Marie was ten years old, so it is possible he was with the family in Tyrone for Hannah’s birth and early childhood. In the 1860 census he was in New York, and he died in Schuyler County. He and his wife had six children that we know of. We are in frequent contact with one of his descendants who has done and continues to do extensive research on the family. Only his father, his grandfather, and Hezekiah’s daughter Adelia come between him and Hannah’s brother Hezekiah. Peter (1799-1885) was one of two very prolific Compton sons. Most Internet records, as well as a granddaughter’s testimony and Peter's obituary, list his wife as Maria Buckbee, but Hannah's Bible and a couple Internet sites mention Elizabeth Hitchman. Even if Elizabeth was a first wife who died early without leaving children, that doesn't explain why Hannah made no mention of Maria in the record she left in her Bible. We have records of Peter and his wife having 14 children. His lengthy obituary gives us insights into his life. He married the year Hannah was born, and he lived in the Lakes area until the 1850s. Three of his children are buried in one cemetery there—son Samuel who died in 1825, and two daughters, a 2-year-old in 1840 and a 15-year-old in 1841. After that, he went to California, then back to New York to raise regiments to fight in the Civil War. He died in 1885 in Rapid City, South Dakota. We just recently learned of one of his descendants working on the Compton branch of her family history. Runyen (1803-1882), the other prolific son (another 14 children), may have been around when Hannah was born, but he moved away from the family fairly early. In fact, he was married in Dearborn, Michigan, in 1826 when she was only five. Some of his children were born there and at least one across the border in Windsor, Ontario, Canada, so it is likely Hannah did not see much of him during her lifetime, and especially her early years. He died in Dearborn. One of his descendants was the first one with whom we made contact through the Internet, and she has done extensive research on all branches of the family. We don’t know much about brother Abraham (1805-?) other than that he married a girl born in Orange Co. Though he was young enough to have surely made the move to Steuben County as a youth, it is possible he found his way back to Orange County…? We have names for three children—Abby, Peter, and William—but no dates or birth places. John Palmer (1809-1871), apparently called John P., was twelve when Hannah was born and was around not only while she was growing up but much longer. His children were born in the Lakes area, but he and his wife died in Chester, Ottawa County, Michigan. We can’t tell whether they migrated there along with Hannah and Charles and their daughters or at a different time. John and his wife had ten children, most of them born in Chemung County, near Steuben County where Hannah was born. John died in Michigan seventeen years before Hannah. He and several of his family are buried in unmarked graves in the Lisbon Cemetery of Kent County, Michigan. We have recently connected with another descendant of his. We know little about William (1810-1863), the 8th child and 7th consecutive son, except that he too married a lady from Orange Co. NY, and he too buried a child in the Donovan Hill area cemetery. Eleven when Hannah was born, he would have been around at least for her early years. He supposedly died in “Lemont,” Michigan, though this is not confirmed. Lamont spelled with an “a” is in Ottawa County, so he may have moved to Michigan along with Hannah and John P, but a 2010 search by a local historian of cemeteries in that area found no record of him. Elizabeth (1812-1874)—finally, another daughter! At nine, Elizabeth would surely have been both big sister and little mother to baby Hannah and to the child Hannah for a number of years. It is easy to picture her lugging Hannah around on her hip. In that day and age, a child her age would surely have spent much of her time helping with family chores, even if she had the opportunity to attend school. Elizabeth and her husband lived and died in the Lakes area, so they would have been part of Hannah’s life until she and Charles moved to Michigan in 1854. Elizabeth married and had at least two children. We know her daughter Hannah died in 1858, though we don’t know how old she was. The son may have died young also. Elizabeth, apparently called Liz or Lizzie, and her husband John died in Watkins, Schuyler County, New York. Susanna (1816-1877), called “Susan” in Hannah’s Bible, also spent her whole life in the Lakes area. She would come the closest to a sibling playmate for Hannah in her early years. Many years later her father, William—the father of the Compton clan—was living (or visiting) in her home when he died sometime after the 1850 census. He was buried there in Watkins. Hannah Phebe had died early in a place called Sugar Hill. Susan had three children—Catherine, Elizabeth, and Edward, but we have no other information on them. So we can draw a fair picture of what life was like for our Great-grandmother Wells in her family when she was growing up. Her sisters were five and nine years older than she, but they would clearly have been part of her life. At least two brothers, John P. and William, were still living at home, as well as perhaps Abraham for a few years. Five of her siblings were adults by the time she was born and played different parts in her life—some large and some small. Whether or not William and Hannah had a baby named Hannah, in 1814 or any other year during that time, one who did not live long. Elizabeth was born to William and Hannah Phebe in 1812 in Orange County (eastern NY). The Lockwoods’ first baby, Frances, was born in 1814 in Steuben County (west central NY). They had three more children born in 1815, 1817, and 1819. Susannah was born to William and Hannah Phebe in 1816 in Tyrone, Schuyler County (bordering Steuben). 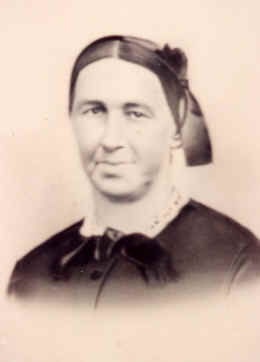 Hannah Marie Compton was born, also in Tyrone, Schuyler County, June 25, 1821. Whatever the order of those events, we can know this: When Hannah Marie was born, her sister Annie was 27 and had four children under seven with another on the way. The four were instant nieces and nephews waiting to welcome baby Hannah. Annie had already named children for her husband's parents and one son for her father, so five months later when her next baby was born a girl, she gave her her mother's name. That made two baby Hannahs, with the one (Hannah Marie Compton) the aunt of the other (Hannah Jane Lockwood). Whether the two 1821 Hannahs were able to be playmates and “grow up” together depends on geography—how close together the families lived around the southern end of Lake Seneca. It is hard to say. The fact that the county lines in that area shifted frequently in those days complicates our sorting out of the area’s geography. For sure, given the means of transportation available to them, distances were more than they would be for us nowadays, but at least the families were closer than if one of them was still back in Orange County on the eastern side of the mountains. In the years that followed while Hannah Marie was growing up, her sister Annie had seven more children—three girls and four boys, including a son who would grow up to marry one of Hannah’s daughters. Annie’s last child was born a year after Hannah was married and not long before her seventeenth birthday. It’s intriguing to imagine what the relationship might have been between those two sisters during those years. When Hannah was in her mid-30s, she and her husband Charles moved further south to Painted Post, New York. After eight years there, they decided to make the major move to Michigan in 1854. Of course it would have been bittersweet to part from their family roots. Hannah’s parents had died by that time, and most of her brothers had moved away from the area, but Annie and the other two sisters and many of their children remained in the Lakes area and ended up dying there. 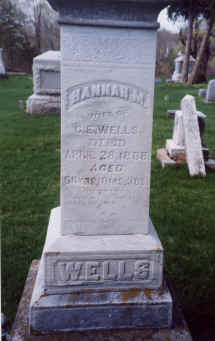 We know for sure brother John P. went to the same township in Michigan as the Wells did, and it’s possible he went the same time as Hannah. We have reports that her brother William ended up there, too, but we haven't found confirmation for that. Though she lived only to age 67, Hannah was the last one of her siblings to die (1888). Sister Annie, on the other hand, who was 27 when Hannah was born and the oldest, lived to age 88 and died only six years before Hannah. Given how many descendants we’ve found who are searching the history of the Compton clan and to find the connection to Sir Spencer Compton, it is clear family history was important to the Compton family long before anyone ever dreamed of the World Wide Web, computers, or electronic genealogy databases.